In Windows 10 and 8.1, the Windows Explorer is called as File Explorer. 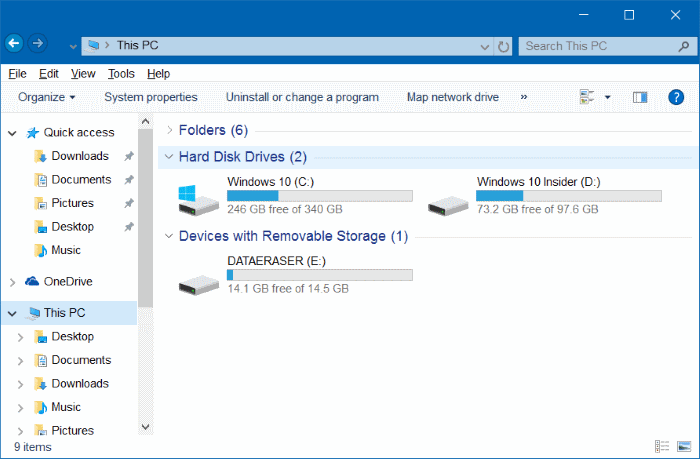 There are a number of changes in Windows 10’s File Explorer compared to Windows 7’s Windows Explorer. 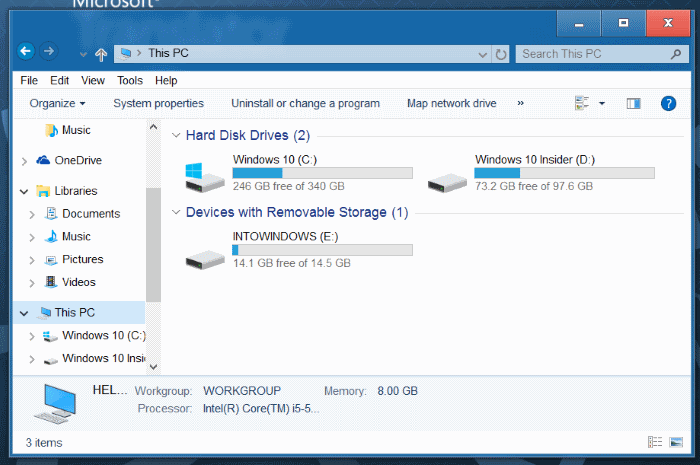 The new ribbon in the File Explorer is possibly the biggest change compared to Windows 7’s Explorer. If you are a user upgraded from Windows 7 to Windows 10 and not happy with the way Windows 10’s File Explorer looks and functions, you can easily make it look and feel like Windows 7’s File Explorer in less than 5 minutes. And moreover, you can give Windows 10’s File Explorer Windows 7 touch without using any transformation or skin packs. You just need to download a single tool called OldNewExplorer. If your intention is to make the File Explorer of Windows 10 look exactly like Windows 7, you need to change the default folder icons of Windows 10 to look like Windows 7 by following the simple directions in our how to get Windows 7 folder icons in Windows 10 guide. The useful details pane has been dropped from Windows 10. In order to get the details pane in File Explorer to make it look like Windows 7, you need to download and run above mentioned OldNewExplorer. Select the option labeled Show details pane at the bottom to enable the same. Note that you might need to restart the Windows Explorer process in order to see the details pane. With default settings, the File Explorer in Windows 10 doesn’t display Libraries in the navigation pane of File Explorer. 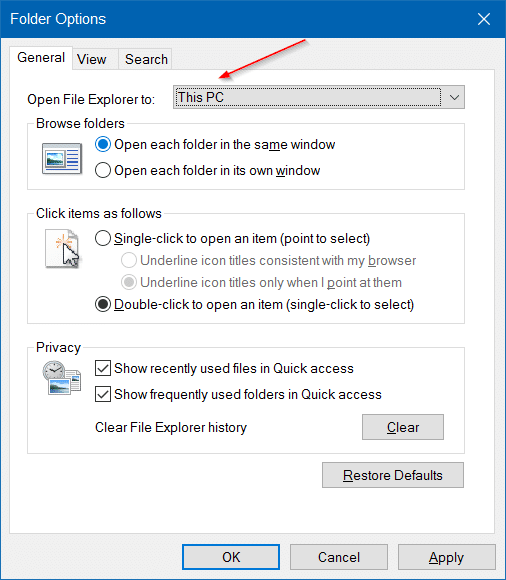 If you want the File Explorer to display Libraries in the navigation pane, just like in Windows 7, check the option labeled Use libraries; hide folders from This PC option in OldNewExplorer. 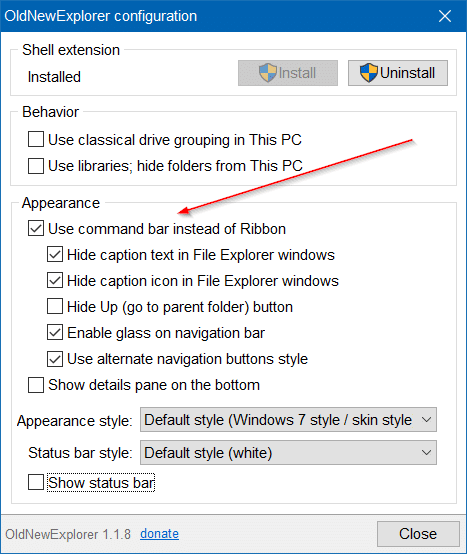 Note that enabling the above option also removes all folders like Documents, Pictures, Videos, and Downloads from This PC. The Windows 7’s Explorer doesn’t display these folders in My Computer. In Windows 7, This PC is opened when you open the Windows Explorer. In Windows 10, however, File Explorer opens to the new Quick Access. 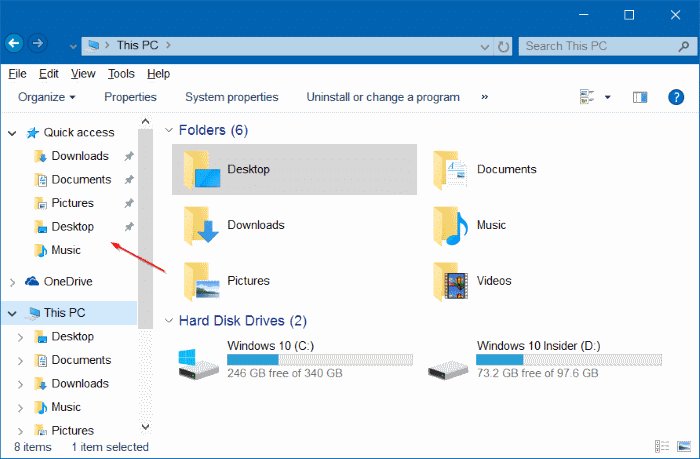 If you want the File Explorer to open to This PC instead of Quick Access, refer to the instructions in our make File Explorer open to This PC in Windows 10 guide. In the navigation pane of File Explorer, the all new Quick Access appears instead of Favorites. In addition to common locations like Desktop, Downloads, Documents, and Pictures, the Quick Access section of navigation pane displays frequently used folders. If you want to stop seeing frequently used folders under Quick Access, open Folder Options (see how to open Folder Options in Windows 10), under the General tab, uncheck the option labeled Show frequently used folders in Quick Access option and then click Apply. As of now, it’s not possible to rename or remove Quick Access from the navigation pane. 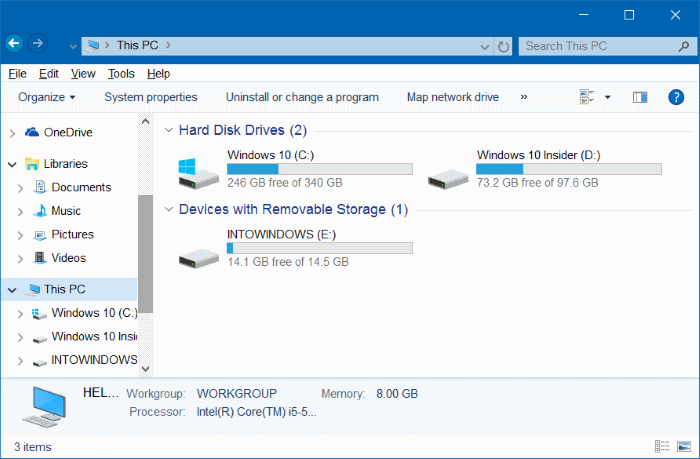 The drive grouping in Windows 10 is not exactly the same as in Windows 7. In fact, this change was first made with Windows 8.1. 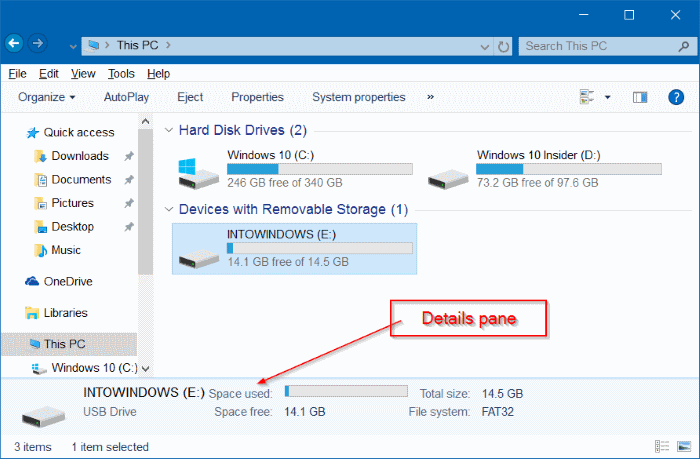 For instance, in Windows 10, connected USB drives appear under Devices and drivers section whereas in Windows 7 there were two sections called Hard Disk Drives and Devices with Removable Storage and all connected USB drives would appear under Devices with Removable Storage section. If you want to same old behavior back in Windows 10 as well, enable the option labeled Use classical drive grouping in This PC option in OldNewExplorer. Unlike in Windows 7, the File Explorer of Windows 10 doesn’t use aero glass transparency for window borders. If you want to enable aero glass for window borders, you need to download a free software called Aero Glass. Go through our how to get Aero Glass Transparency in Windows 10 right now guide for detailed instructions. When you install Aero Glass tool, it also installs Windows 7-like Aero compatible theme (visual style). So you don’t need to download separately download Windows 7 like theme. Don’t forget to check out our how to make Windows 10 look like Windows 7 guide.